Not to be confused with Tex-Mex cuisine, which is often referred to as "Mexican food" in certain regions of the United States and Canada. Mole sauce, which has dozens of varieties across the Republic (mole poblano pictured), is seen as a symbol of Mexicanidad and is considered Mexico's national dish. The Mexica establishment of the Aztec Empire created a multi-ethnic society where many different foodways became infused. The staples are native foods, such as corn, beans, squash, amaranth, chia, avocados, tomatoes, tomatillos, cacao, vanilla, agave, turkey, spirulina, sweet potato, cactus, and chili pepper. After the Spanish conquest of the Aztec Empire in the 16th century, Europeans introduced a number of other foods, the most important of which were meats from domesticated animals (beef, pork, chicken, goat, and sheep), dairy products (especially cheese and milk), and rice. While the Spanish initially tried to impose their own diet on the country, this was not possible. African and Asian influences were also introduced into the indigenous cuisine during this era as a result of African slavery in New Spain and the Manila-Acapulco Galleons. Over the centuries, this resulted in regional cuisines based on local conditions, such as those in Oaxaca, Veracruz and the Yucatán Peninsula. Mexican cuisine is an important aspect of the culture, social structure and popular traditions of Mexico. The most important example of this connection is the use of mole for special occasions and holidays, particularly in the South and Central regions of the country. For this reason and others, traditional Mexican cuisine was inscribed in 2010 on the Representative List of the Intangible Cultural Heritage of Humanity by UNESCO. Ingredients at a market in Mexico City, including huitlacoche, quintoniles, huauzontle and squash flowers. Mexican cuisine is as complex as other ancient cuisines, such as those of Indian Cuisine, China and Japan, with techniques and skills developed over thousands of years of history. It is created mostly with ingredients native to Mexico, as well as those brought over by the Spanish conquistadors, with some new influences since then. In addition to staples, such as corn and chile peppers, native ingredients include tomatoes, squashes, avocados, cocoa and vanilla, as well as ingredients not generally used in other cuisines, such as edible flowers, vegetables like huauzontle and papaloquelite, or small criollo avocados, whose skin is edible. Vegetables play an important role in Mexican cuisine. Common vegetables include zucchini, cauliflower, corn, potatoes, spinach, Swiss chard, mushrooms, jitomate (red tomato), green tomato, etc. Other traditional vegetable ingredients include chiles, huitlacoche (corn fungus), huauzontle, and nopal (cactus leaves) to name a few. European contributions include pork, chicken, beef, cheese, herbs and spices, as well as some fruits. Tropical fruits, many of which are indigenous to Mexico and the Americas, such as guava, prickly pear, sapote, mangoes, bananas, pineapple and cherimoya (custard apple) are popular, especially in the center and south of the country. Despite the introduction of wheat and rice to Mexico, the basic starch remains corn in almost all areas of the country and is the base of many recipes (e.g. corn tortillas, atole, pozol, menudo, tamal). While it is eaten fresh, most corn is dried, nixtamalized and ground into a dough called masa. This dough is used both fresh and fermented to make a wide variety of dishes from drinks (atole, pozol, etc.) to tamales, sopes, and much more. However, the most common way to eat corn in Mexico is in the form of a tortilla, which accompanies almost every dish. Tortillas are made of corn in most of the country, but other versions exist, such as wheat in the north or plantain, yuca and wild greens in Oaxaca. A molcajete and tejolote, the traditional mortar and pestle of Mexico. The other basic ingredient in all parts of Mexico is the chile pepper. Mexican food has a reputation for being very spicy, but it has a wide range of flavors and while many spices are used for cooking, not all are spicy. Many dishes also have subtle flavors. Chiles are indigenous to Mexico and their use dates back thousands of years. They are used for their flavors and not just their heat, with Mexico using the widest variety. If a savory dish or snack does not contain chile pepper, hot sauce is usually added, and chile pepper is often added to fresh fruit and sweets. The importance of the chile goes back to the Mesoamerican period, where it was considered to be as much of a staple as corn and beans. In the 16th century, Bartolomé de las Casas wrote that without chiles, the indigenous people did not think they were eating. Even today, most Mexicans believe that their national identity would be at a loss without chiles and the many varieties of sauces and salsas created using chiles as their base. Many dishes in Mexico are defined by their sauces which are usually very spicy; the chiles those sauces contain, rather than the meat or vegetable that the sauce covers. These dishes include entomatada (in tomato sauce), adobo or adobados, pipians and moles. A hominy soup called pozole is defined as white, green or red depending on the chile sauce used or omitted. Tamales are differentiated by the filling which is again defined by the sauce (red or green chile pepper strips or mole). Dishes without a sauce are rarely eaten without a salsa or without fresh or pickled chiles. This includes street foods, such as tacos, tortas, soup, sopes, tlacoyos, tlayudas, gorditas and sincronizadas. For most dishes, it is the type of chile used that gives it its main flavor. Pechuga adobada, chicken breast in adobo with a side of chayote, mushrooms, corn and poblano rajas. Adobo, including a key item, vinegar, arrived with the Spanish. A common characteristic of Mexican adobo is its incorporation of chile ancho. Some of the main contributions of the Spanish were several kind of meat, dairy products and wheat to name few, as the Mesoamerican diet contained very little meat besides domesticated turkey, and dairy products were absent. The Spanish also introduced the technique of frying in pork fat. Today, the main meats found in Mexico are pork, chicken, beef, goat, and sheep. Native seafood and fish remains popular, especially along the coasts. The main meal of the day in Mexico is the "comida", meaning 'meal' in Spanish. This refers to dinner or supper. It begins with soup, often chicken broth with pasta or a "dry soup", which is pasta or rice flavored with onions, garlic or vegetables. The main course is meat served in a cooked sauce with salsa on the side, accompanied with beans and tortillas and often with a fruit drink. In the evening, it is common to eat leftovers from the comida or sweet bread accompanied by coffee or chocolate. Breakfast can consist of meat in broth (such as pancita), tacos, enchiladas or meat with eggs. This is usually served with beans, tortillas, and coffee or juice. 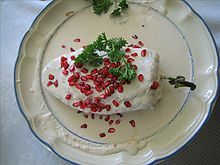 Chiles en nogada, due to the dish's incorporation of red, white and green, is popularly consumed during the celebrations of the Grito de Dolores. The ability to cook well, called "sazón" (lit. seasoning) is considered to be a gift generally gained from experience and a sense of commitment to the diners. For the Day of the Dead festival, foods such as tamales and mole are set out on altars and it is believed that the visiting dead relatives eat the essence of the food. If eaten afterwards by the living it is considered to be tasteless. In central Mexico, the main festival foods are mole, barbacoa, carnitas and mixiotes. They are often prepared to feed around five hundred guests, requiring groups of cooks. The cooking is part of the social custom meant to bind families and communities. Mexican regional home cooking is completely different from the food served in most Mexican restaurants outside Mexico, which is usually some variety of Tex-Mex. Some of Mexico’s traditional foods involved complex or long cooking processes. Before industrialization, traditional women spent several hours a day boiling dried corn then grinding it on a metate to make the dough for tortillas, cooking them one-by-one on a comal griddle. In some areas, tortillas are still made this way. Sauces and salsas were also ground in a mortar called a molcajete. Today, blenders are more often used, though the texture is a bit different. Most people in Mexico would say that those made with a molcajete taste better, but few can do this now. A Maya lord sits before an individual with a container of frothed chocolate. The other staple was beans, eaten with corn and some other plants as a complimentary protein. Despite this, studies of bones have shown problems with the lack of protein in the indigenous diet, as meat was difficult to obtain. Other protein sources included amaranth, domesticated turkey, insects such as grasshoppers, beetles and ant larvae, iguanas, and turtle eggs on the coastlines. Vegetables included squash and their seeds; chilacayote; jicama, a kind of sweet potato; and edible flowers, especially those of squash. The chile pepper was used as food, ritual and as medicine. A reconstructed kitchen at the 16th century former monastery of San Miguel Arcángel, Huejotzingo, Puebla. Mexican educator Justo Sierra said that "the grocer, not the conquistador, is the real Spanish father of Mexican society." Las Tortilleras, an 1836 lithograph after a painting by Carl Nebel of women grinding corn and making tortillas. Hot chocolate and pan dulce are the quintessential breakfast in Mexico. Many of Mexico's sweet breads were influenced by French immigrants. In the latter 20th century, international influence in Mexico has led to interest and development of haute cuisine. In Mexico, many professional chefs are trained in French or international cuisine, but the use of Mexican staples and flavors is still favored, including the simple foods of traditional markets. It is not unusual to see some quesadillas or small tacos among the other hors d'oeuvres at fancy dinner parties in Mexico. Two large jars of aguas frescas. On the left is filled with jamaica and on the right is with horchata. Bottles of artisanal mezcal. Tequila is differentiated from mezcal by its complicated production and its protected designation of origin. Corn in Mexico is not only eaten, but also drunk as a beverage. Corn is the base of a hot drink called atole, which is then flavored with fruit, chocolate, rice or other flavors. Fermented corn is the base of a cold drink, which goes by different names and varieties, such as tejuino, pozol and others. Aguas frescas are flavored drinks usually made from fruit, water and sugar. Beverages also include hibiscus iced tea, one made from tamarind and one from rice called "horchata". One variant of coffee is café de olla, which is coffee brewed with cinnamon and raw sugar. Many of the most popular beverages can be found sold by street vendors and juice bars in Mexico. Chocolate played an important part in the history of Mexican cuisine. The word "chocolate" originated from Mexico's Aztec cuisine, derived from the Nahuatl word xocolatl. Chocolate was first drunk rather than eaten. It was also used for religious rituals. The Maya civilization grew cacao trees and used the cacao seeds it produced to make a frothy, bitter drink. The drink, called xocoatl, was often flavored with vanilla, chile pepper, and achiote. Cochito, one of exclusively Chiapas' dishes. A café de chinos in the historic center of Mexico City. These cafes were run by Chinese Mexicans and became popular in the 20th century. Because it is just a city, the main feature of Mexico City cooking is that it has been influenced by those of the other regions of Mexico, as well as a number of foreign influences. This is because Mexico City has been a center for migration of people from all over Mexico since pre-Hispanic times. Most of the ingredients of this area’s cooking are not grown in situ, but imported from all of the country (such as tropical fruits). Street cuisine is very popular, with taco stands, and lunch counters on every street. Popular foods in the city include barbacoa (a specialty of the central highlands), birria (from western Mexico), cabrito (from the north), carnitas (originally from Michoacán), mole sauces (from Puebla and central Mexico), tacos with many different fillings, and large sub-like sandwiches called tortas, usually served at specialized shops called 'Torterías'. There are eateries that specialize in pre-Hispanic food, including dishes with insects. This is also the area where most of Mexico’s haute cuisine can be found. A cabrito (goat) on a spit in Monterrey, Nuevo León. When the Europeans arrived, they found much of the land in this area suitable for raising cattle, goats and sheep. This led to the dominance of meat, especially beef, in the region, and some of the most popular dishes include machaca, arrachera and cabrito. The region's distinctive cooking technique is grilling, as ranch culture has promoted outdoor cooking done by men. The ranch culture has also prompted cheese production and the north produces the widest varieties of cheese in Mexico. These include queso fresco (fresh farmer's cheese), ranchero (similar to Monterey Jack), cuajada (a mildly sweet, creamy curd of fresh milk), requesón (similar to cottage cheese or ricotta), Chihuahua’s creamy semi-soft queso menonita, and fifty-six varieties of asadero (smoked cheese). Grilled arrachera, shrimp, sausage, onions, potatoes and chiles toreados served on an iron skillet. In Northeastern Mexico, during the Spanish colonial period, Nuevo León was founded and settled by Spanish families of Jewish origin (Crypto-Jews). They contributed significantly to the regional cuisine with dishes, such as Pan de Semita or "Semitic Bread" (a type of bread made without leavening), capirotada (a type of dessert), and cabrito or "baby goat", which is the typical food of Monterrey and the state of Nuevo León, as well as some regions of Coahuila. The north has seen waves of immigration by the Chinese, Mormons, and Mennonites, who have influenced the cuisines in areas, such as Chihuahua and Baja California. Most recently, Baja Med cuisine has emerged in Ensenada and elsewhere in Baja California, combining Mexican and Mediterranean flavors. Chocolate being poured at a market at Villa de Etla, Oaxaca. Huachinango a la veracruzana, a dish based on red snapper. The African influence is from the importation of slaves through the Caribbean, who brought foods with them, which had been introduced earlier to Africa by the Portuguese. As it borders the Gulf coast, seafood figures prominently in most of the state. The state’s role as a gateway to Mexico has meant that the dietary staple of corn is less evident than in other parts of Mexico, with rice as a heavy favorite. Corn dishes include garnachas (a kind of corn cake), which are readily available especially in the mountain areas, where indigenous influence is strongest. Mojarra frita served with various garnishes, including nopales, at Isla de Janitzio, Michoacán. The main Spanish contributions to Michoacán cuisine are rice, pork and spices. One of the best-known dishes from the state is morisquesta, which is a sausage and rice dish, closely followed by carnitas, which is deep-fried pork. The latter can be found in many parts of Mexico, often claimed to be authentically Michoacán. Other important ingredients in the cuisine include wheat (where bread symbolizes fertility) found in breads and pastries. Another is sugar, giving rise to a wide variety of desserts and sweets, such as fruit jellies and ice cream, mostly associated with the town of Tocumbo. The town of Cotija has a cheese named after it. The local alcoholic beverage is charanda, which is made with fermented sugar cane. A bowl of cochinita pibil, a dish flavored with achiote. Recado rojo is used for the area’s best-known dish, cochinita pibil. Pibil refers to the cooking method (from the Mayan word p'ib, meaning "buried") in which foods are wrapped, generally in banana leaves, and cooked in a pit oven. Various meats are cooked this way. Habaneros are another distinctive ingredient, but they are generally served as (or part of) condiments on the side rather than integrated into the dishes. Frijol con puerco prepared with beans, pork, epazote, onion, cilantro, lemon, radishes and habanero chile. A prominent feature of Yucatán cooking is tropical fruits, such as tamarind, plums, mamey, avocados and bitter oranges, the latter often used in the region's distinctive salsas. Honey was used long before the arrival of the Spanish to sweeten foods and to make a ritual alcoholic drink called balché. Today, a honey liquor called xtabentun is still made and consumed in the region. The coastal areas feature several seafood dishes, based on fish like the Mero, a variety of grunt and Esmedregal, which is fried and served with a spicy salsa based on the x'catic pepper and achiote paste. Other dishes include conch fillet (usually served raw, just marinated in lime juice), cocount flavored shrimp and lagoon snails. Mexican food in the United States is based on the food of northern Mexico. Chili con carne and chimichangas are examples of American food with Mexican-origins known as Tex-Mex. With the growing ethnic Mexican population in the United States, more authentic Mexican food is gradually appearing in the United States. One reason is that Mexican immigrants use food as a means of combating homesickness, and for their descendants, it is a symbol of ethnicity. Alternatively, with more Americans experiencing Mexican food in Mexico, there is a growing demand for more authentic flavors. ^ a b "El mole símbolo de la mexicanidad" (PDF). CONACULTA. Retrieved 27 September 2016. ^ "La cocina del virreinato". CONACULTA. Retrieved 13 January 2015. ^ a b c d e "Traditional Mexican cuisine - ancestral, ongoing community culture, the Michoacán paradigm". UNESCO. Retrieved January 13, 2015. ^ a b c MacNeil-Fife, Karen (September 2000). "Beyond beer: Wine with Mexican food". Sunset. 205 (3): 194. ^ a b Malat, p. 88. ^ a b c d e Adapon, p. 11. ^ a b c Iturriaga, p. 43. ^ a b Graber, Karen Hursh (January 1, 2003). "Rice: The Gift Of The Other Gods". Mexconnect newsletter. ISSN 1028-9089. Retrieved October 24, 2012. ^ a b Adapon, p. 7. ^ a b c Adapon, p. 8. ^ a b c Graber, Karen Hursh (October 1, 2000). "A guide to Mexican cheese: Los quesos mexicanos". Mexconnect newsletter. ISSN 1028-9089. Retrieved October 24, 2012. ^ a b Adapon, p. 93. ^ "Los chiles en nogada en la cena del 15 de septiembre". Procuraduría Federal del Consumidor. Retrieved 27 September 2016. ^ a b Adapon, p. 117. ^ a b c Adapon, p. 89. ^ a b Adapon, p. 101. ^ a b c Knepp, Mark Dustin (2010). Tamaladas and the role of food in Mexican-immigrant and Mexican-American cultures in Texas (PhD). State University of New York at Albany. Docket 3412031. ^ a b Iturriaga, p. 130-133. ^ a b c Sharpe, Patricia (December 2004). "More Mexican—It's About Time; Mexican food through the ages". Texas Monthly. 32 (12): 1. ^ a b Luengas, p. 30. ^ a b Adapon, p. 9. ^ a b c d e f g Adapon, p. 10. ^ Fernández, Adela (1985). Tradicional cocina mexicana y sus mejores recetas. Panorama Editorial. pp. 33–. ISBN 978-968-38-0131-9. ^ Hill, Owen (6 September 2007). "Mexican food". Caterer & Hotelkeeper. 197 (4492): 13. ^ "Chocolate: A Mesoamerican Luxury 250–900 C.E. 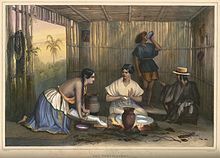 (A.D.) – Obtaining Cacao". All About Chocolate: History of Chocolate. Field Museum of Natural History. Archived from the original on 18 March 2009. Retrieved 2 June 2008. ^ "Chocolate: A Mesoamerican Luxury 250–900 C.E. (A.D.) – Making Chocolate". All About Chocolate: History of Chocolate. Field Museum of Natural History. Archived from the original on 18 March 2009. Retrieved 2 June 2008. ^ "Achiote (Annatto) Cooking". las Culturas. Archived from the original on 17 May 2008. Retrieved 21 May 2008. ^ Cocina Estado por estado: Chiapas [State by state cuisine: Chiapas] (in Spanish). 7. Mexico City: El Universal /Radar Editores. 2007. ^ a b c Graber, Karen Hursh (January 1, 2003). "The cuisine of Chiapas: Dining in Mexico's last frontier". Mexconnect newsletter. ISSN 1028-9089. Retrieved October 24, 2012. ^ a b c d "Regional Foods of Mexico". University of Michigan. April 10, 2008. Archived from the original on January 13, 2013. Retrieved October 24, 2012. ^ a b Graber, Karen Hursh (January 1, 2004). "Dining in the DF: food and drink in Mexico's capital". Mexconnect newsletter. ISSN 1028-9089. Retrieved October 24, 2012. ^ Tomky, Naomi (March 2012). "5 Sandwiches You Should Eat in Mexico". Serious Eats. Serious Eats Inc.
^ a b c d e Perez, Ramona Lee (2009). Tasting culture: Food, family and flavor in Greater Mexico (PhD). New York University. Docket 3365727. ^ a b c d e Graber, Karen Hursh (January 1, 2006). "The cuisines of Northern Mexico: La cocina norteña". Mexconnect newsletter. ISSN 1028-9089. Retrieved October 24, 2012. ^ "Traditional food of Nuevo León". Gobierno del Estado de Nuevo León. Retrieved 16 March 2012. ^ Jewish Encyclopedia: Carabajal. Accessed Mar 5, 2011. ^ Cocina Estado por estado: Oaxaca [State by state cuisine: Oaxaca] (in Spanish). 1. Mexico City: El Universal /Radar Editores. 2007. ^ a b c d Graber, Karen Hursh (January 1, 2006). "The Cuisine of Oaxaca, Land of the Seven Moles". Mexconnect newsletter. ISSN 1028-9089. Retrieved October 24, 2012. ^ Graber, Karen Hursh (January 1, 2006). "The cuisine of Veracruz: a tasty blend of cultures". Mexconnect newsletter. ISSN 1028-9089. Retrieved October 24, 2012. ^ a b Graber, Karen Hursh (January 1, 2004). "The Cuisine of Michoacán: Mexican Soul Food". Mexconnect newsletter. ISSN 1028-9089. Retrieved October 24, 2012. ^ Cocina Estado por estado: Michoacán [State by state cuisine: Michoacán] (in Spanish). 5. Mexico City: El Universal /Radar Editores. 2007. ^ Cocina Estado por estado: Colima Jalisco [State by state cuisine: Colima Jalisco] (in Spanish). 12. Mexico City: El Universal /Radar Editores. 2007. ^ a b c Graber, Karen Hursh (January 1, 2007). "The cuisine of Jalisco: la cocina tapatia". Mexconnect newsletter. ISSN 1028-9089. Retrieved October 24, 2012. ^ Forever, Mexican. "How To Make and Love Your Very Own Mexican Pozole". 5amily. Retrieved 2018-12-16. ^ Cocina Estado por estado: Baja California, Baja California Sur [State by state cuisine: Baja California, Baja California Sur] (in Spanish). 11. Mexico City: El Universal /Radar Editores. 2007. ^ a b c d e Graber, Karen Hursh (January 1, 2006). "The cuisine of the Yucatan: a gastronomical tour of the Maya heartland". Mexconnect newsletter. ISSN 1028-9089. Retrieved October 24, 2012. ^ "Yucatan Mayan Food". Mayan-yucatan-traveler.com. Archived from the original on 2015-08-28. Retrieved 2015-09-11. ^ Bayless, Rick; Brownson, JeanMarie; Bayless, Deann Groen (Fall 2000). "Cochinita Pibil Recipe". Mexico—One Plate at a Time. Scribner. Retrieved 2015-11-26. ^ Winfree, Laura (12 August 2010). "Yucatan Seafood: Ceviche de Chivitas". Gringation Cancun. Retrieved 11 September 2015. ^ Xiong, Mao (2009). Affective testing on the seven moles of Oaxaca (PhD). California State University, Fresno. Docket 1484546. Abarca, Meredith E. (2006). Rio Grande/Río Bravo: Borderlands Culture, 9 : Voices in the Kitchen : Views of Food and the World from Working-Class Mexican and Mexican American Women. College Station, TX, USA: Texas A&M University Press. ISBN 9781585445318. Adapon, Joy (2008). Culinary Art and Anthropology. Oxford: Berg Publishers. ISBN 978-1847882134. Iturriaga, José N. (1993). La Cultura del Antojito [The Culture of Snack/Street Food] (in Spanish). Mexico City: Editorial Diana. ISBN 968 13 2527 3. Luengas, Arnulfo (2000). La Cocina del Banco Nacional de México [The Cuisine of the National Bank of Mexico] (in Spanish). Mexico City: Fomento Cultural Banamex. ISBN 968 7009 94 2. Malat, Randy, ed. (2008). Passport Mexico : Your Pocket Guide to Mexican Business, Customs and Etiquette. Barbara Szerlip. Petaluma, CA, USA: World Trade Press. ISBN 978-1885073914. Wikimedia Commons has media related to Cuisine of Mexico. Wikivoyage has a travel guide for Mexican food.